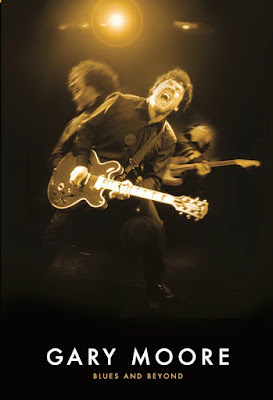 The work of the late Irish guitarist Gary Moore will be featured on “Blues And Beyond”, a new collection of studio and live performances set for release on November 24. After making a name for himself in the late 1960s with the Dublin-based Skid Row and his numerous stints with classic rockers Thin Lizzy in the 1970s, Moore set out on a lengthy and successful solo career as a blues-based guitarist before his 2011 passing at the age of 58 from a heart attack following a night of heavy drinking while on vacation in Spain. The multi-format “Blues And Beyond” features Moore’s blues studio recordings alongside previously unreleased live material. 2CD and 4LP packages highlight the guitarist’s studio work, while a 4CD box set edition presents that material and adds a never-before-released live album and the official Gary Moore biography, “I Can’t Wait Until Tomorrow”, by Harry Shapiro. The box also includes a number of reproductions of ultra-rare memorabilia items including a concert ticket, album launch event invite, VIP wrist band and AAA pass. Best known for his solo hits “Parisienne Walkways” and “Still Got The Blues”, Moore mixed rock and blues while playing live and on record with George Harrison, Jack Bruce, Ginger Baker, Greg Lake, B.B. King, Albert King, Albert Collins and many others.